2015 ArchiCAD BIM Competition was cloed with happiness and proud of all students, lecturers, juries leaving for registered teams, particularly winners. This competition spent a period of 3 months from officail announcement to final round. All teams competed together through three interesting rounds: First round – Idea, Second round – BIM Model, after this round, the best ten groups would be collected in Final round – Presentation in front of the jury panel. The topic of 2015 competition is “The story of Identities: one upon a time, Saigon was….”. The exciting stoty is called by type of the cultural building – District 5 Cultural Center, HCMC. This is really a big challenge for all contestants. All of them should spend much time researching culture, history and development of Cho Lon town – one of the most unique China towns in the world, finding integration of 2 cultures – Vietnamese and Chinese. Finally, these stories will be described by amazing ideas showing harmony behaviors between a new cultural center and accient houses around. The language of cultural architecture will be explored in the best by form, space, material, feeling of surface, color, lighting and landscape. 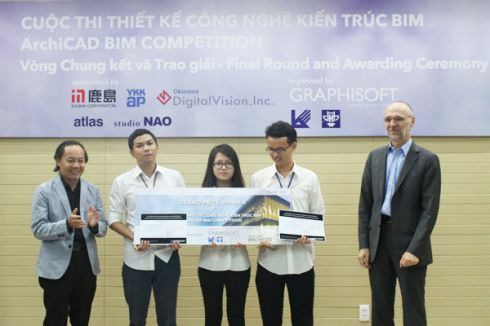 Though to impressive presentation, Team H.G.T including students – Luu Vinh Hoang, Tran Ngoc Giao & Nguyen Vinh Hoang Thao was deserving of the grand prize of 2015 ArchiCAD BIM Competition with the project “Two Saigon Halves”. The unique idea bases on two halves of Vietnamese and Chinese cultures. One major axis is created in the center of the site, it slices the site by two parts. Each one tells us a private story of content, functions and particular architecture which describes specific cultural values of the Vietnamese and the Chinese. However, these cultures can live together at the main axis where all traditionally cultural activities of the Chinese and Saigonese are happened. The strategy of team H.G.T is organisation functional spaces underground, permit penetration of daylight through courtyards. This way brings some benefits: an increase of green space area on the ground creating interesting relaxing spaces for citizens and playgrounds for kids; a decrease of construction coverage as well as quantity levels of the whole building which not destroy landsmark and a general look with around context. 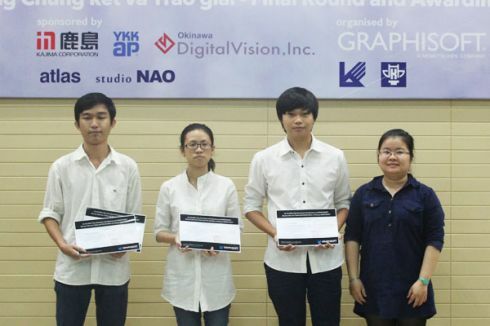 Congratulations 2015 ArchiCAD BIM Competition. Hope for more meaningful and creative competitions for all architectural students in the near future. 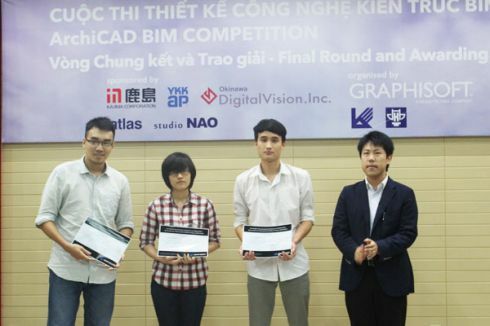 2015 ArchiCAD BIM Competition was very successful with many reasons: this year, the competition was opened to students in Hanoi University of Architecture, this is a good chance for all students contesting and overcoming challenges of the competition. It attracted many registration of students from two schools. Many projects got high appreciation of juries from first round by very impressive ideas. Besides, this year, more sponsors agreed to accompany with the competition.